This oil painting portrays the construction of a barge at a dry-dock owned by Constable's father. It is based on a tiny pencil drawing in a sketchbook at the V&A. Constable painted the landscape entirely in the open air. His biographer C. R. Leslie praised its 'atmospheric truth', such that 'the tremulous vibration of the heated air near the ground seems visible'. The scene is a pleasant summer's day on the banks of the river Stour. A barge is being constructed in Constable's father's boat-yard by the mill to carry his flour down to Mistley in Essex on its way to London. 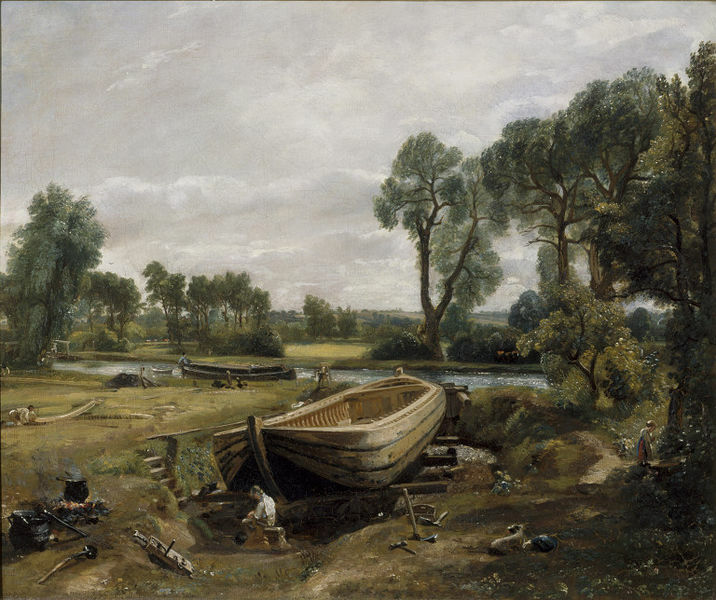 The unfinished boat is shown with a degree of detail unusual for Constable, but it is not painted with any more care than the surrounding trees. The general effect is of a placid, tranquil and uneventful day. In 1815 Constable exhibited five paintings and three drawings at the Royal Academy, including 'Boat-building' (No. 137). His mother died early this year and he was in Suffolk in May. He left London again for Suffolk on 6 July and remained there most of the year, being detained during December by his father's serious illness. 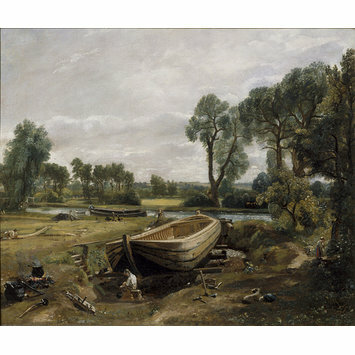 Oil painting entitled 'Boat-Building near Flatford Mill' by John Constable. Great Britain, 1815. Evans, M., with N. Costaras and C. Richardson, John Constable. Oil Sketches from the Victoria and Albert Museum, London: V&A, 2011, p. 20, fig. 14.